Happy National Volunteer Week! This year, National Volunteer Week is April 7-13. It’s a great time to reflect on our past successes in the park and look forward to the future. 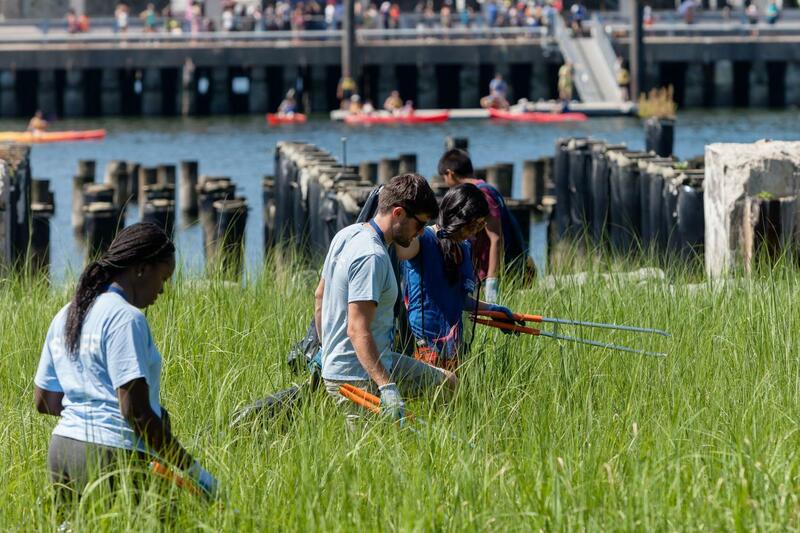 Last year, 660 volunteers donated over 3,000 hours of service to Brooklyn Bridge Park. They helped remove 2500 lbs of trash from our shoreline and 55 cubic yards of unwanted foliage (leaves, weeds and natural debris). In honor of National Volunteer Week, here are ten ways you can get involved in the park this year. 1) Green Team: Attend one of our Green Team Sessions. Green Team Volunteers assist our Gardeners every Saturday morning, May-October. In honor of Earth Day, we will be hosting a special Green Team on Saturday, April 20th. 2) Coastal Cleanup: Help us during one of our Coastal Cleanup events! During low tide, volunteers help remove trash from our beaches, salt marshes and shoreline. We will be holding our first Coastal Cleanup of the year on April 20th in honor of Earth Day. 3) Spring Cutback: Our seasonal opportunity in which overwintered grasses are cutback by gardeners and volunteers. Our last Cutback of the year is this Wednesday, April 10th-sign up on our Spring Cutback page, or through your Volunteer Profile. 4) City Nature Challenge: On Saturday, April 27th we will host a tour in conjunction with the City Nature Challenge! Using the iNaturalist App, we will be documenting all of the living organisms (plants, animals, birds) we find in the park. The tour starts at the classroom at 334 Furman Street, email Elizabeth Harnett at eharnett@brooklynbridgepark.org for more information. Families are welcome! 5) Seining: Get out in the East River with our Education Staff! 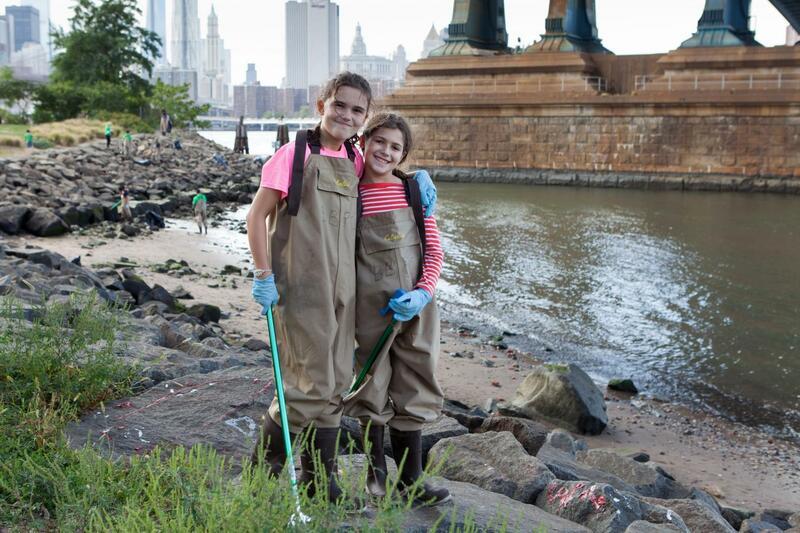 Volunteers assist our seining program by fishing for organisms in the East River. Catches are counted, monitored, and released. Seining takes place on select Saturdays throughout the summer on Pier 4 Beach. If you are coming for your first Seining, please arrive 30 minutes early to sign a waiver, try on some waders, and get trained on the work site. 6) Attend a Volunteer Orientation: Come to one of our Volunteer Orientations and learn about the history of the park, the Conservancy, and all things Volunteer. We go over our various Volunteer Opportunities available in the park. 7) Education Center: Volunteer at our Education Center. Volunteers assist our Education Staff with Open Hours and School Programs throughout the year. Volunteers help greet visitors, share information about the Center, and answer questions. Orientation is required for this opportunity. 8) Festival Volunteers and Park Greeters: Help our programs run smoothly, and welcome visitors to the Park. Park Greeters greet visitors at our Mobile Info Station on the weekends, and distribute park information. Festival Volunteers help facilitate activities and conduct visitor surveys. Volunteers are required to take an Orientation. 9) Photography: Record the park in action! Volunteer Photographs take pictures of various programming, including Volunteer Opportunities, Open Hours, Concerts and Festivals. Photographers are credited for their work. Orientation is required. 10) Enjoy the park! If you can’t commit to a Volunteer Session, share the joy and beauty of Brooklyn Bridge Park with others. Bring your friends and family down to the waterfront and enjoy a beautiful day at the park.